Robert “Bobby” Arnold and Lori Perko – are among the best vocalists in the Florida College System. 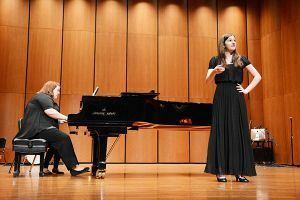 The two vocal performances majors won the male and female vocal categories at the Florida College System Activities Association Music Symposium Student Artist Competition held Jan. 26-28 at Jacksonville University. Arnold, a tenor, competed against 10 male vocalists, while Perko, a soprano, beat out eight female contestants from colleges across Florida for the honors. As winners, both will receive $1,000 per year for their junior and senior years at a Florida university of their choice. Don Snowden, Pensacola State’s district academic department head and director of bands, said this marks the first time the college has had multiple winners in the FCSAA music competition. Arnold, 25, and Perko, 19, described the historic double win as a surreal experience. “The vocalists are the last winners to be announced and when I heard Bobby’s name, I was so happy and proud of him. It had crossed my mind that it would really be cool for us both to win but it was just a thought,” said Perko, who will graduate in May. Arnold said after competing in 2016, he really prepared for this competition. “I didn’t even place last year but I knew what I had to do – so I practiced every day, ran every day, and just did what I needed to do. That was my mindset, I wanted to do well and I wanted to succeed,” said the former boxer who will graduate in May 2018. The 2010 Pine Forest High graduate sings a variety of genres from classical to rock and hip-hop. “I’ve been singing since I was young but never realized my range until I enrolled here at Pensacola State,” he said. Arnold said he hasn’t decided where he’ll continue his education after Pensacola State, but he definitely wants a career as a performer. Perko, a 2015 Escambia Virtual Academy graduate, has been singing for about 10 years, and hasn’t chosen where she will continue her education. “Eventually, I want to become a choir director or pursue a career in the opera,” she added. Also during the symposium, 27 Pensacola State students participated in a statewide band, chorus and guitar ensemble led by the Jacksonville University faculty. 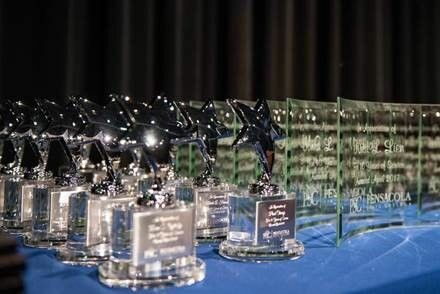 Sponsored by the FCSAA and the Florida Association of Schools of Music, the Student Artist Contest is open to community/junior college music students. Students compete in categories of brass, keyboard, percussion, strings, woodwinds, classical guitar, voice and jazz performance.